I have been stamping off and on for more than a decade. I am not always sure it shows. I am still finding my voice. I have a lot to improve on although this is a good thing as I have so much more to learn and new places to venture. I used a lot of patterned paper on this one in addition to the stamps. 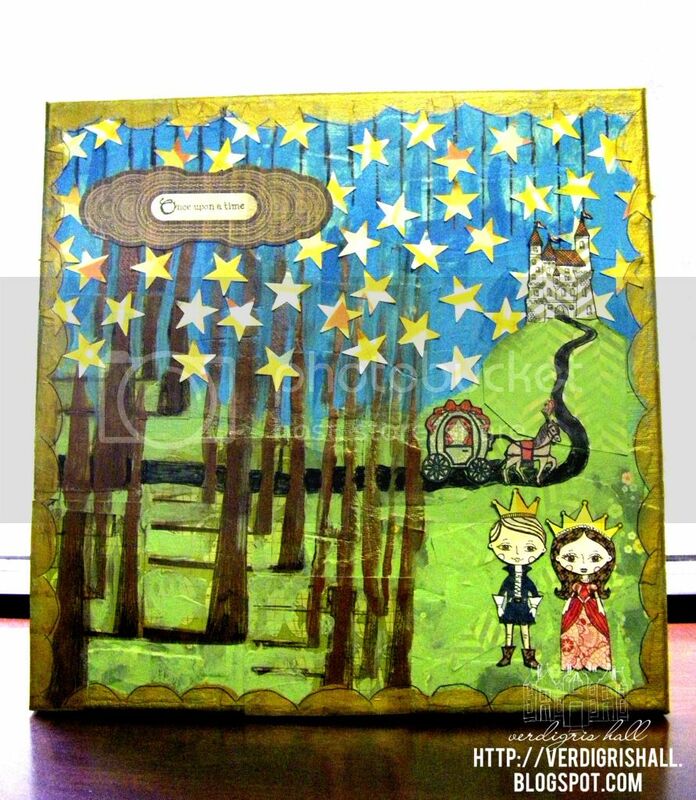 All of the background paper and stars come from various Studio Calico patterned papers along with the castle and the crowns. The Prince and Princess and horse drawn carriage are from 6x6 paper pads: Paper Heart by Crate Paper (gorgeous collection that I still love); Kissing Booth by Basic Grey and Madison Avenue of Lost & Found by My Mind's Eye. Any coloring in came from Copic markers. The paint is all acrylic. The detailed marker is a black Precision Pen (outlining the scallop border for instance) from American Crafts which worked well over the dry paint. I need to say I used matte Multi-Medium by Claudine Hellmuth Studio by Ranger for the first time to adhere the pieces of pattern paper to the canvas and it worked like a dream. I am sold. For more instructions and details check out this post HERE. Is it a success? Sort of. Would I change some things? Yes and maybe I will. Do you also evaluate your projects to gauge what needs improvement? What was the last project you sighed with a sense of well-being about? As always your time and attention are greatly appreciated!